Riding a wave of momentum created by the Eagles' triumph in the Super Bowl, the Sixers were well on their way to doing some damage in the playoffs. Winners of eight straight games, Philadelphia was poised to be the upstart team nobody wanted to face in the playoffs, with injuries and uncertainty for other squads opening a gap they were poised to fill. The window of opportunity might have slammed shut on Wednesday night. Though the rest of the team was able to bring home a win against the Knicks, Sixers center Joel Embiid was involved in a scary collision with point guard Markelle Fultz. 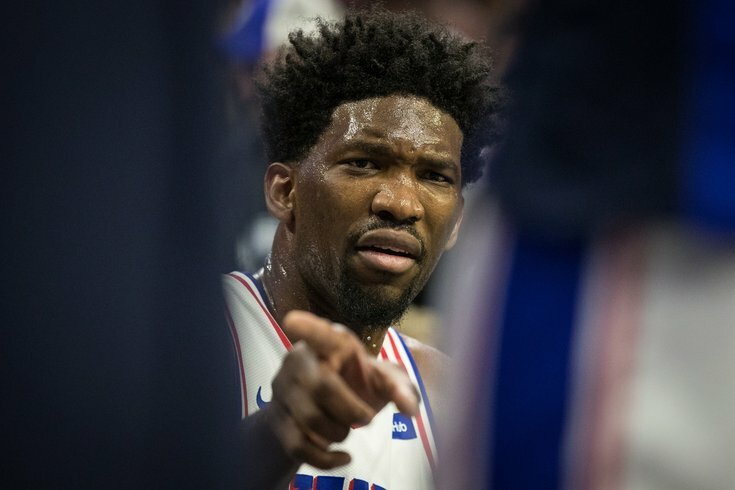 After suffering an injury at the 11:50 mark of 2nd quarter of last night’s game against New York, Joel Embiid was initially evaluated in the locker room and later taken to Jefferson Hospital for further evaluation and testing. Immediately following the injury, Embiid was assessed for a concussion, was asymptomatic at that time, and passed the NBA’s locker room concussion assessment tool. However, he later began experiencing symptoms, has since been diagnosed with a concussion, and has been placed in the NBA’s concussion protocol. Embiid also underwent a CT scan, which revealed an orbital fracture of his left eye. Surgery will be performed in the coming days to address the orbital fracture, and further updates will be provided as appropriate. To say this is a game-changer is not really doing the situation justice. Embiid has been one of the most impactful players in all of the NBA this season, anchoring the best five-man unit in the NBA. Eight games are left before Philadelphia's regular season comes to an end, and even if Embiid is able to undergo surgery as soon as Friday, March 30, that still only leaves him with 15 days of recovery time between now and the start of the playoffs on April 14. Prepare yourselves for the biggest "No duh!" statement you'll hear about the Sixers all season: They are a much worse team without Embiid on the floor. The numbers spell this out quite clearly. When Embiid is on the court for the Sixers, they have the offense of a top-five team and the best defense in all of basketball. Once he hits the bench, things tend to fall apart, and their offense drops into territory occupied by some of the league's worst teams. PTS/100 possessions PTS allowed/100 poss. Those numbers are a bit misleading because the numbers drop for just about any team when their best players leave the court. But the Sixers are especially dependent on Embiid in a way many NBA teams aren't, because he is the fulcrum of both their offense and their defense. There are very few centers who serve as offensive centerpieces for their team in 2018. The list is basically Embiid, Kristaps Porzingis, Nikola Jokic, DeMarcus Cousins, and Karl-Anthony Towns once Jimmy Butler went down with an injury. Even among those contemporaries, Embiid is at the top of the list in terms of offensive responsibility. His 33.9 usage rate — a measure of the percentage of a team's possessions a player uses while on the floor — trails only the likely MVP, James Harden, for the highest mark in the league. Even that probably sells his responsibility short, because everything about Philadelphia's offense really only works because of Embiid's varied skills. Ben Simmons is an uber-talented rookie, but Philadelphia has gotten away with his lack of shooting in large part because of the man up front. The Sixers ask Embiid to hover on the perimeter throughout the game, taking him away from his favored low-post position to stretch the floor and clear the paint. This difference is clear when Embiid is subbed out for backup Amir Johnson, who is effectively left alone at the same spot near the top of the key. Defenders sag back into the paint to wall off the rim from Simmons and other would-be drivers, and it depresses their offense. While the rest of the team only sees their effectiveness take a slight hit with Johnson on the court, Simmons takes a nosedive. His field-goal percentage drops by over eight percent when Johnson is on the floor, and a lot of the snug pick-and-rolls Simmons crushes with Embiid just don't open up with Johnson as the screener. Instead of having to account for Embiid popping out for a mid-range or three-point jumper, opponents can drop toward the rim and clutter the paint for Simmons. It eliminates his ability to step through and/or around defenders, forcing him to take tougher shots if he attempts one at all. And this is before we get to how critical Embiid is to the Sixers defensively. The Sixers do have the pieces to make up for some of the loss there, with Covington and Simmons offering athleticism and great instincts on the perimeter and Johnson at least giving you the instincts part on the back end. But you don't simply replace a player who is a top candidate for Defensive Player of the Year honors. Embiid is special on the defensive end, and though he doesn't put up historic numbers as a shot-blocker, his combination of length and intelligence makes it damn near impossible to beat him at the summit. Some teams don't even bother trying, with big men passing up shots and resetting the offense, only for Embiid to close on a shooter and force a different sort of tough shot. There's nobody else on the roster and very few players in the league that represents an elite defense by themselves. Embiid is one of them, and, combined with the offensive load he carries, it's an impossible task to replace him. How can the Sixers replace his offensive production? Though it may be impossible, the Sixers are going to have to try anyway. The good news is that the upcoming schedule remains extremely friendly for Philadelphia, and they should remain favorites in the majority of their remaining eight games. Four of the games they have left to play — twice against Atlanta, and once each against Brooklyn and Dallas — are against teams whose seasons are effectively over, and the Sixers will benefit from tank-centric lineups. Two more are against teams (Charlotte and Detroit) that are on the verge of elimination and at least a notch below the Sixers' level. You don't always need to reinvent the wheel to keep things on track, and the good news is that Philadelphia's other young talent is plenty diverse enough to handle more responsibility. A lot of fingers will point toward Simmons, and it's certainly true he'll need to be part of the effort. While his numbers without Embiid on the court were in the negatives for most of the early part of the season, he has slowly figured out how to keep the offense ticking when the big man hits the bench. In the games Embiid has missed due to injuries or rest throughout the season, Simmons has been a mixed bag in terms of stepping up his scoring output. His best effort without Embiid was a 27-point outburst against the New Orleans Pelicans back in December, a game in which he did everything possible to drag the Sixers over the line. It didn't end up being enough, but the level of physicality he played with was impressive and should be a template for his play in Embiid's absence. But the bigger responsibility may fall on Dario Saric, who despite sharing very little in common with Embiid physically may be the best player to replicate the inside-out package Embiid brings on offense. This is where Saric's history as a Swiss army knife really comes in handy. He has played pretty much every role you can imagine between the NBA and his time overseas: post-up player, spot-up shooter, point-forward, off-ball cutter, and brilliant passer are all hats he has worn and worn well. Brett Brown has asked Saric to focus a lot more on the shooting, cutting, and passing elements while playing alongside Embiid, but with the center in recovery, the Sixers can stick Saric on the block some more. Late in their win against the Knicks on Wednesday, the Sixers set up a look where Saric inherited Embiid's role in the post with JJ Redick serving as his outlet at the elbow of the three-point line, similar to the two-man game they've run in crunch-time all year. Saric is a more natural passer out of the post (and in general) than Embiid, and the off-ball movement Marco Belinelli has added can turn this into a designed passing play, instead of a set that necessitates the player posting to create his own shot. When it's time for Simmons to set up shop on the low block, where his passing vision can cut teams wide open, Saric can continue to serve as the elite perimeter outlet he has been all year. RELATED: Which potential first-round matchup is best for Sixers? If you're looking for a silver lining here — and believe me they are hard to find — the loss of Embiid may inspire some creativity and flexibility on the behalf of Coach Brown. You're going to see some players and looks featured that otherwise wouldn't have seen the light of day, and that's at least moderately exciting. The obvious place to start is with their pair of No. 1 picks. Brown has been quite clear that Markelle Fultz will serve as the primary backup to Simmons for the time being, jumping back into the mix in a capacity that feels comfortable and familiar to him. The logic behind it is sound. But it may not be as set in stone as you'd think, especially not after Embiid's injury. Prior to the game against the Knicks on Wednesday, Brown pointed out the tangible things he can use as baselines for Fultz's progress, from his assist-to-turnover ratio to his willingness to shoot, and then described how there's more to it than what's in the box score. "I interpret [the stats] as confidence. You're not going to have that thumbprint on that little volume of minutes without being proactive. That's a tangible example," said Brown. "Then there's the gut feel, the fit with other people, can he go more to a two [guard]? Does it always have to be Ben's backup? Is he ready just to play basketball in March?" There may not have been a reason to tinker with lineup composition before, but Embiid's absence changes that. Long-term, the goal is to have Simmons and Fultz sharing the court for long stretches of the game. Why not try to get a preview of that now, with a light schedule to aid those plans? That was certainly the plan early in the season, as we saw in the team's opening preseason game against Memphis. Fultz's shooting concerns overshadowed just about everything else at the time, but there were early signs of an understanding between the two even then. Granted, the books are out on these guys now and teams respect their jumpers much less than they did way back in October. Not the sort of thing you want to gamble on in a playoff series. The Sixers are better equipped to handle that reality with the personnel they've assembled for the stretch run. Brown has shown he has little trust or patience for Richaun Holmes at the five, though his role will certainly grow in the absence of Embiid. But don't be surprised if Brown leans on small-ball lineups featuring either Saric or Ersan Ilyasova at center, which he has turned to even with Embiid available to play. They've only shared the court for about 121 possessions, per Cleaning The Glass, but the Ilyasova-Saric pairing has been wildly successful so far. The Sixers have outscored opponents by 8.3 points per 100 possessions with that small-ball configuration, and there are all sorts of ways to take advantage of their strengths on offense. You can put four shooters on the floor alongside Simmons or Fultz and just dare teams to help off guys like Redick and Belinelli on the perimeter. Good luck. At the end of the day, we're still operating with incomplete information. Philadelphia's playoff spot is already locked up, which minimizes some of the panic setting in. There's no risk of falling out of the playoffs, and an optimistic timeline would see Embiid return during their first-round series. If he doesn't, it will be tough for the Sixers to beat any of the teams they'll be up against. And while the organization has been building up to this playoff run for years now, this run figures to be just the beginning of a bright future. The Sixers are still building toward the point in time when they have a legitimate chance to compete. Things breaking right around them over the last month should not have changed the long-term view on when this team will be ready to hang with the big boys. The talent is there now, but the experience and refinement is not. And that's okay. Embiid has done everything to prove he is an All-NBA talent who demands respect every time he steps on the floor. Simmons is having one of the most productive rookie seasons in history, and another full offseason will bring him closer to true stardom. Saric's shooting improvement, Covington's defensive excellence, and Fultz's dynamism as a ballhandler are all things that can help propel the program forward, with or without the addition of a max free agent this summer. The foundation has been established, and the wait has proven worth it so far. While everyone would like to see Embiid back out there as soon as possible, cupping his ear as a playoff crowd chants his name at the Wells Fargo Center, head injuries are nothing to play around with. His long-term health and safety should always be the priority here, and there should be no repercussions on his career as long as he moves forward with caution. Besides, nothing fits this town more than an underdog story, and I know quite a few of you still have German shepherd masks laying around at home. If it takes thousands of rowdy fans and a team filled with high-character players to survive the loss of a star, there are few cities better equipped to handle it than Philadelphia.